There is no question that the weather during winter can be totally unpredictable and quite often we get caught out when the weather turns. The weather is also hugely influential if you happen to work outdoors the year round. Let’s face it if you’ve been out in the cold for several hours, one of the first things you are likely to want to do when you get home is take a hot shower or a long soak in a hot bath. However, for many of us the reality is that we have a bathroom or shower room that isn’t conducive for doing anything other than getting as clean as possible as quickly as possible with no real sense of enjoyment. If this is the case for you, then isn’t it about time you considered a new bathroom installation or wet room installation in your home. After all we’re not talking about decadence and luxury but more a case of you making the most of your home. It may or may not come as a surprise to you to learn that loft conversions and bathroom installations or wet room installations are the most common improvements homeowners have carried out on their properties. Here at Baines Bathrooms in Bristol it is fair to say that the majority of bathroom installations we carry out our four homeowners who have just moved or who are looking to upgrade the home they are in. One of the joys of our business is that we are secure in the knowledge that money spent on a new bathroom installation is money wisely spent and will not only increase the value of your property but also increase its salability at some point in the future. More often than not the biggest question isn’t so much should we have a new bathroom or wet room installed but whether it is a new bathroom or wet room. It is an unfortunate fact of life that for many of us today time is perpetually limited and therefore it may be only on the rarest of occasions we are able to lie back and enjoy a long soak in the bath. 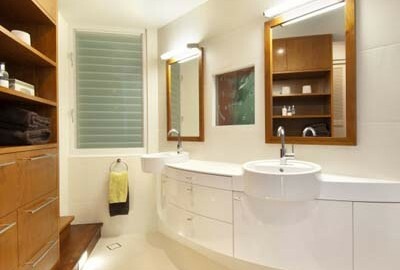 As a consequence, the practicalities of a stylish wet room can be remarkably tempting. The truth is if you come in from the cold and wet either option is going to be appealing, but there is nothing nicer than warming yourself up in a cosy bathroom or shower room which is no longer just a functional room in the house but a room where you can afford to spend a few extra minutes simply enjoying the surroundings. Of course a new bathroom installation or wet room installation is not something you have done every day of the week and therefore decisions need to be made both on the style of sanitary ware and also, perhaps of greater importance, the tiles used which will dominate the room. As a consequence, here at Baines’s Bathrooms not only can we provide you with an accurate estimate of the likely costs involved in upgrading an existing bathroom or shower room, but we can also help you with your choice of fixtures and fittings. So why not give us a call here in Bristol and invite a site to have a chat with you about the options available and how we can help make a dramatic difference to your home?